Visit our new [»» Jacket Notes pages]: readings, new books & magazines, blogs, etc. We only have time to read for Jacket in June, July and January: please don’t send material out of season. [»»] Pandora, Australia’s free Internet Archive at the National Library of Australia. Copyright Information (for Jacket authors and copyright owners): Jacket asks for single-use non-exclusive electronic world rights, in order to protect your rights from exploitation by others. You retain all copyright, and you may publish the work anywhere in any form at any time. You don’t have to ask Jacket’s permission: just do it. It would be nice if you mentioned previous appearance in Jacket. 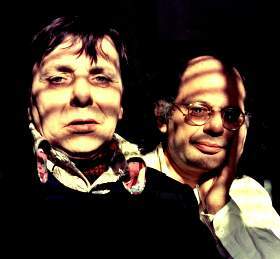 Herbert Huncke, Allen Ginsberg, near window of Ginsberg’s E. 12th Street apartment, New Year’s 1976. Photo copyright © Gordon Ball. [»»] Pieces on «Pieces of Air in the Epic», by Brenda Hillman: Barbara Claire Freeman, Editor. “The generic convention of the book review is monologic; however nuanced and subtle, the constraints of the form typically allow the inclusion of only one perspective. This collection of short texts on the poems in Brenda Hillman’s Pieces of Air in the Epic intends first, to present a kind of collective ‘book review,’ that is, a form of writing about poems that demands a plurality of individual voices; and second, to provide a forum in which poets respond to and explore a particular poem.” — B.C.F. Brenda Hillman was born in Tucson, Arizona in 1951. After receiving her B.A. at Pomona College, she attended the University of Iowa, where she received her M.F.A. 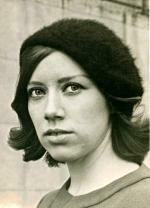 in 1976.She has published seven collections of poetry: White Dress (1985), Fortress (1989), Death Tractates (1992), Bright Existence (1993), Loose Sugar (1997) and Cascadia (2001), Pieces of Air in the Epic (2005); all published by Wesleyan University Press. She resides in the San Francisco Bay Area; she is married and has a daughter. [»»] Stan Apps: «Folly», by Nada Gordon. [»»] Andrew J. Browne: «Don’t Ever Get Famous: Essays on New York Writing after the New York School», edited by Daniel Kane. [»»] Cliff Fell: Eliot Weinberger, «What happened here» (second edition) and «Muhammad», both published by Verso, 2006.